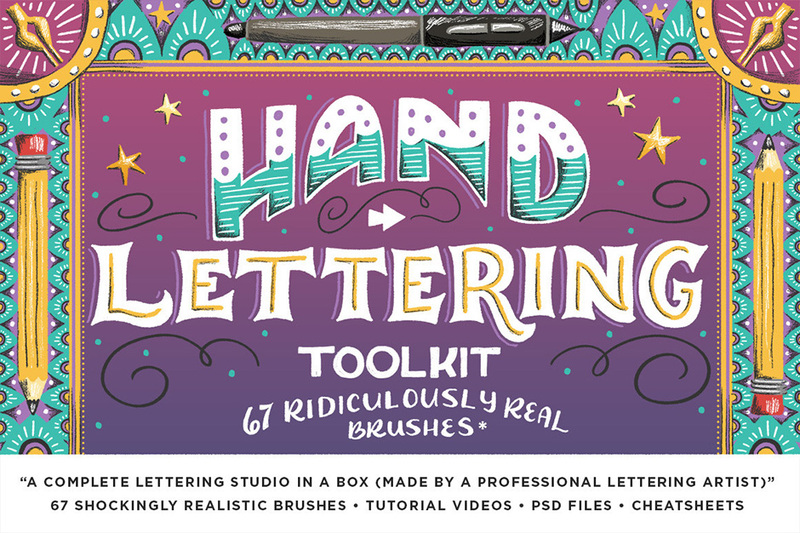 Say hello to The Hand Lettering Toolkit – 67 Ridiculously Real Brushes + Bonuses! This is a collection of 67 Photoshop brushes* created to work harmoniously together to create gorgeous hand lettering work. File size is approx 100MB (159.3MB unzipped), offered as a single download. Where are the 3 STANDARD Speed Video Tutorials (see brush names, key commands and more) located? The page they provide a link to does have videos, however they are speed illustrations of less than about 3mins with no way to really tell what/how the product is actually being used.. Thank you so much for coming back to SJ and for giving us some more information, this is really useful so thank you so much for taking the time to investigate this on your side! We are just waiting to hear back from the designer and will give you an update as soon as we can, so our sincerest apologies for any delay caused! In the meantime if you have any other questions, or if there is anything else that we can help you with, please do not hesitate to ask! Hi Annabel, any update on this? Thanks, got the emails. Appreciate the update and attention given to this. Hi, I am a huge fan of DC since I discovered you guys a few months ago, but thinking how I can use these tools for the Affinity suite (photo and designer)? I have the Adobe tools until December *time when my free license I got from a raffle but thinking how I can port this out before I buy. I definitely would want to improve my handlettering skills and tools. So this particular kit actually comes with .tpl files which are not currently compatible with Affinity I’m afraid! We do have another Hand Lettering Kit from Retro Supply Co also available in our Birthday event which might suit you a bit better in Affinity- https://bit.ly/2OAk3pW as this is compatible with PS CS4 which usually means it will work in Affinity! I hope that helps but if you have any questions, please do let me know! I just bought these and a few other items from the awesome Birthday sale (Happy Birthday DC!!). I have Affinity, which imports abr files, but not tpl files. Alas, these are tpl! Is there any chance we can get the abr files as well? This set comes with .tbr files only I am afraid Lori- I know there was discussion of Affinity updating their software to allow for tool presets but it has yet to be implemented. I am so sorry to disappoint you about this! Would love a ProCreate version of these brushes! But getting the PS ones too! Thanks for the fab pricing on this one! Happy Birthday. We will definitely pass your feedback onto the team at Retro Supply Co to see if a ProCreate version could be looked at! Also are they pressure sensitive? I am looking for brushes which can provide thick and thin strokes, as you normally would obtain on paper with a brush pen. This one is only compatible with Photoshop because this is where the designer created the files so these weren’t tested in AI unfortunately! Hi There! I just recently discovered Design Cuts and I love it. I’m about to download some items but before doing so, I was wondering about this particular HAND LETTERING TOOLKIT BY RETRO SUPPLY CO.? I do in fact have AI CC, as well as Photoshop CC; however, I haven’t utilized Photoshop yet, but I am definitely becoming somewhat versed in Illustrator. My main question is will this particular pack work in Illustrator???? I’m not quite ready to delve into Photoshop. Please advise before I make this purchase. Thank you so much for your kind words and a huge welcome to Design Cuts from the whole team 🙂 We’re so pleased you’re enjoying your experience with us! I’m really sorry but I’m afraid that this pack is only compatible with Photoshop so I’m afraid it will not work for you in Illustrator. I’m sorry to be the bearer of bad news on this one but rest assured, we do have some awesome Illustrator brushes in our marketplace that will definitely work for you 🙂 please do let me know and I will happily offer some suggestions for you! I hope this helps, Chris, and please don’t hesitate to contact me should you have any other questions. I’m always happy to help! I just finished downloading this and I’m really confused with the brushes installation? It’s actually a “tool” [.tpl] and NOT a “brush” [.abr], so I have no idea how to access and/or use the brushes once I have them installed in my tools…they do not show up in my brushes? Help! Thank you so much for your comment. I’m really sorry to hear that you are having some trouble installing these brushes as tool presets. Rest assured, I’m on the case to get you up and running again 🙂 I’ve sent you a quick email to assist you with this. I hope it helps! Oops – never mind my previous comment – I only have CS3. Sorry! No problem at all, Julie! If there is ever anything else I could assist you with please do get in touch. I’m always happy to help! Hi Ben. I am hoping to buy the latest program that includes this pack. How advanced of a Photoshop user do I have to be to really be able to use it? I am def a beginner. Thanks. I’m a bit confused by this offer. Looks interesting but unsure how it would fit into my work. I create watercolor designs and then scan and work with them in PS. Is there a video anywhere that I can view before committing to purchase? I have been eyeballing this over on CM, but was wondering if I need to have a drawing tablet in order to use this? Thanks so much for getting in touch and for your interest in this item! I can certainly help you with you query. I hope this helps, Diana, and please don’t hesitate to contact me should you have any other questions. I’m always happy to help!